A free shawl pattern and a free scarf pattern, suitable for a man, both perfect for summer warm weather knitting, both interesting no-brainers. No oxymorons here, it's true: interesting patterns you don't have to think about. So whilst sitting at the beach, talking to friends and family, you can still keep knitting without losing your place in the pattern. Both of these projects are extremely portable and won't take up much room in your travel bag. 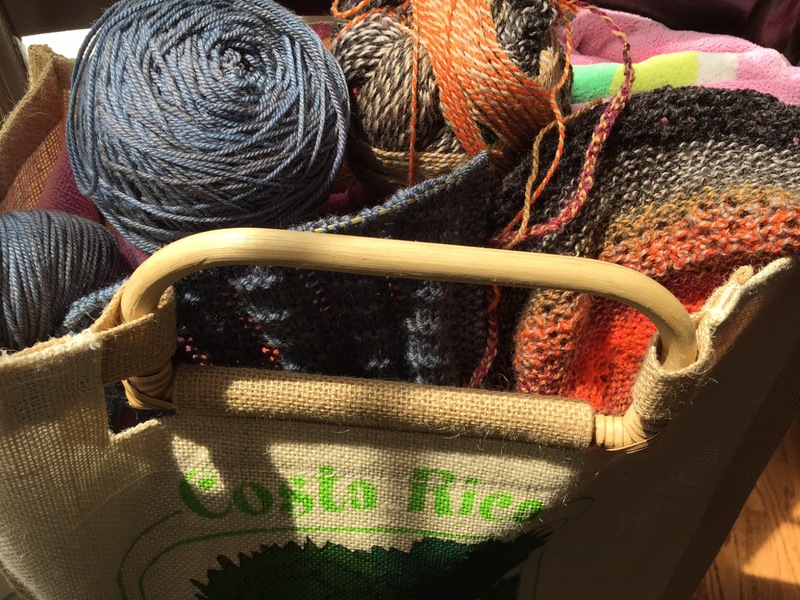 Don't stop knitting and get ahead on your gift list! "Reyna" is a free shawl slash scarf pattern created by Noora Laviola. 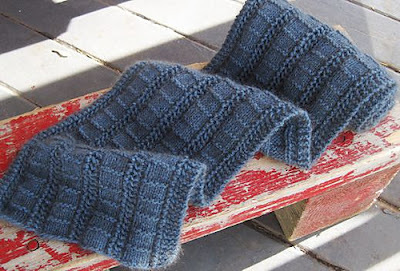 There are two, two-row patterns, one a garter stitch and the other a yarnover lace, and very easy to remember. I used Schoppel-Wolle's Crazy Zauberball #2092 for this knitting project and mixed it up a little, adding rows according to the colors that were showing. 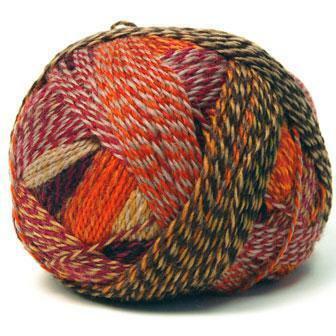 I'm using a US 6 (4mm) circular needle, my preference, but you can also use straight needles. Schoppel-Wolle might seem pricey, but has a ton of yardage, 459 yards in a 100 gram ball. 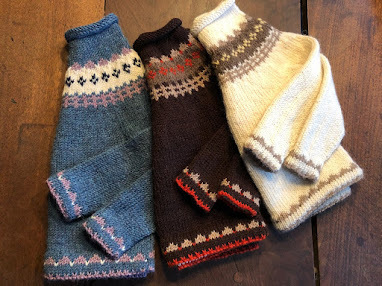 $21.95 each at Noble Knits. But you only need one ball for Reyna! 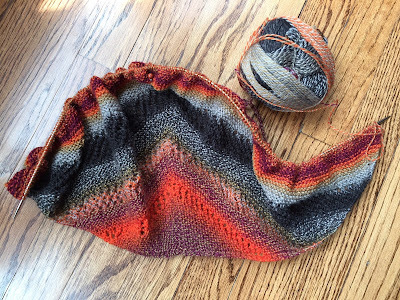 Months ago, I had started knitting socks with this yarn, but made the first one too big, so ripped it out, wrapped and tied the used yarn, washed and started anew with the Reyna shawl pattern. The colors are just right to give to a high school friend of mine. The shawl pattern is available in English, Czech, French, and German translations. You'll find the link below. Here is the finished version created by the designer. And here is my Reyna, unfinished. I'm planning it as a house gift for the fall, so school fall colors! The second, a free scarf pattern, I think you'll like. 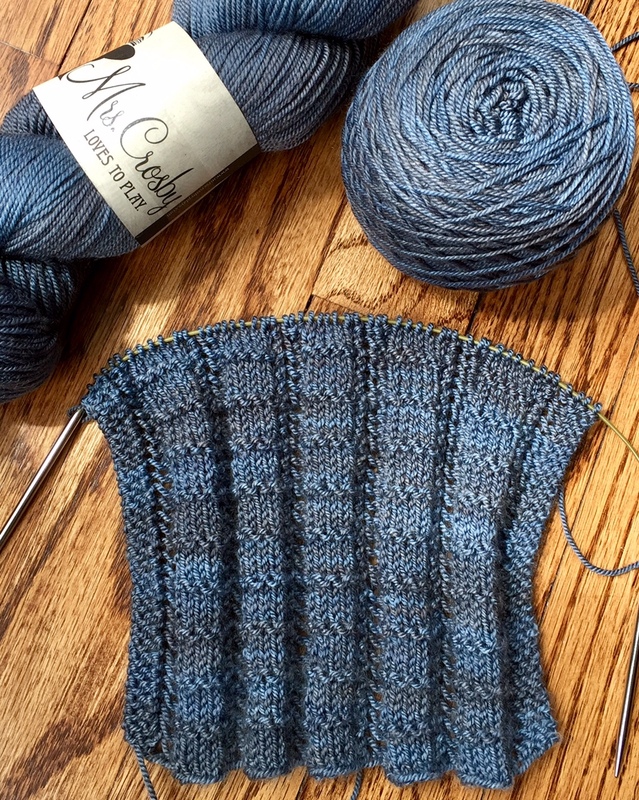 I'm knitting Mary Keenan's "Railyard Scarf" for our son, and we all know it is really hard to find a scarf pattern suitable for a man, which isn't boring stitch-wise but still masculine. This pattern is completely reversible, has six rows of pattern, which I guarantee you will know by the end of the sixth row. I'm using a new found yarn, Mrs. Crosby Loves to Play, Hat Box. It's a DK hand-dyed yarn, merino wool, silk, and cashmere, soft as a baby's bottom, each skein 317 yards, runs about $27.00 each; right now it's on sale at great savings at yarn.com, and boy, would I love some more. This colorway is "Submarine" and gorgeous. I am using a US 6 (4mm) 16" circular needle but you can also use straight needles. Here's the designer's finished Railyard scarf. The pattern link is below. 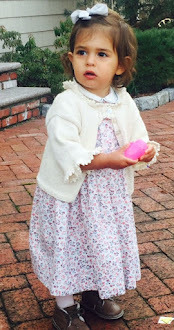 The scarf pattern is sized for children through adults, three sizes. The largest size requires 560 yards for 60" of scarf. I measured my son's store-bought Scotland-made scarf and it was 60". Enjoy the weather and happy knitting!